As an ultra runner I’m running on average 60 miles per week. 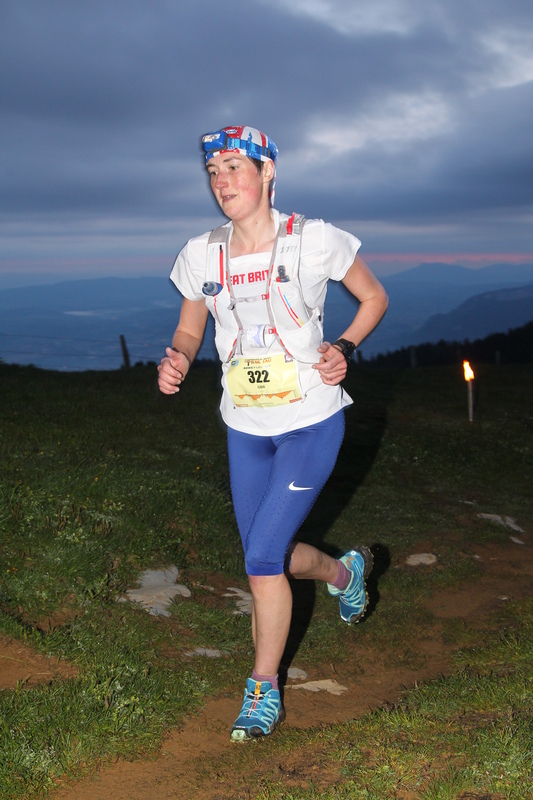 Recent selection for the Trail World Championships for GB & NI in Annecy resulted in my training changing to lots of hilly miles. This meant on average I was running for to 9-10 hours per week, alongside working as a physio for 40-50 hours per week! I’ve had a fractured rib and a foot stress fracture over the last 3 years, very frustrating as a runner! This led to nutrition and supplementation becoming more important to me. Whilst I think I have a pretty good diet I’ve made mistakes with my nutrition in the past. One of those was insufficient vitamin D leading to bone weakness as it’s vital for calcium absorption. One of the main contributing factors for me was too high a factor sun cream, as I’m out all day I was using high factor once a day stuff, so basically wasn’t absorbing much from the sun and it’s very difficult to get from the diet alone. That’s why I’m now using the BetterYou Vitamin D supplement. I’m also using the BetterYou Multi Vitamin to ensure I get enough vitamins due to my high training load. Whilst my diet is good, the demand for nutrients to aid recovery and energy while training is difficult to get fully from my diet so I’m enjoying incorporating BetterYou Total Nutrition into my meals, current favourites are adding it to omelette mixes and also adding it to my homemade pizza dough. I’m sure the Magnesium Spray is aiding my muscle recovery too, I use it every morning after my shower. Initially it caused tingling to my skin for an hour or so, indicating low magnesium levels. Now I don’t get any skin irritation and my muscle recovery is much quicker. The day after the Trail World Championships I managed a 6 mile mountain walk and the Delayed Onset Muscle Soreness was completely gone in 3 days. The course in Annecy was 53 miles with 5300m of ascent so my quads took quite a battering! It’s now only 11 days after the event and I managed a 17 mile trail run after work tonight without any problems! 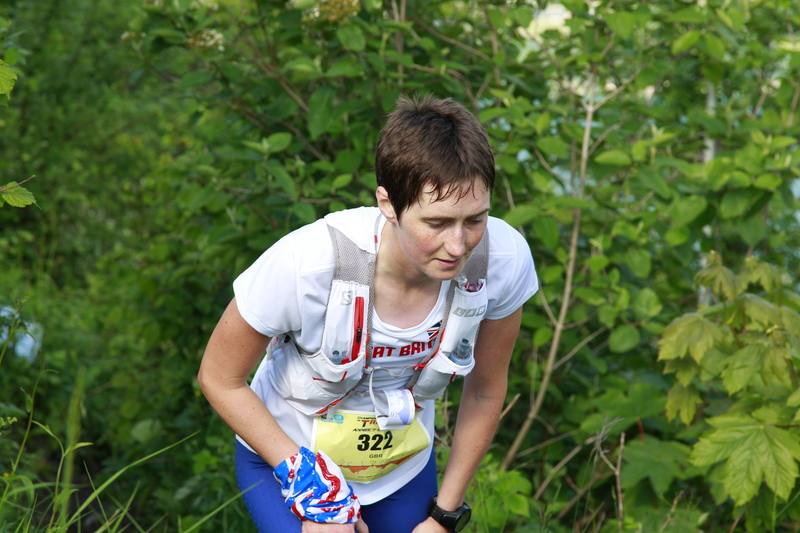 I was surprised I wasn’t nervous about the Trail World Championships, just very excited as we traveled to Geneva Airport, my first experience in GB kit! We were there a day before the team so myself and Bonnie did a nice easy run to re-familiarise ourselves with the final 5 miles of the course. That afternoon we met the rest of the team and team managers in the athletes village, it was great to finally meet up with everyone. The nerves did start to build here as we set off for the opening ceremony. It was a long drawn out few hours, but great to parade onto the stage in our matching GB gear. So onto the day before the race, the way the professional’s do it – rest, rest and more rest! I’ve never been so rested prior to a race and was really enjoying the opportunity to just lazy about in the sun reading my book. I also slept a surprising amount during the day, I’m sure it all came in handy when the alarm was set for 1 am for the race! The 3.30 am race start time didn’t bother me, I wasn’t going to get the best night’s sleep that night anyway so may as well get running before it gets too hot. I’d spent all winter running with a head torch so the dark woodland trail for the first few miles didn’t daunt me. Nervous wait to get started in the middle of the night! So to the start, the first 2 miles were flat around the lake, I expected it to be a fast start but tried not to get too carried away, I did though clocking a 6.38 first mile! I was a lot more sensible for the next few miles, getting into a nice pattern of running and walking depending on the inclines. We came out of the woods as daylight was improving to a grassy slope, I recognised that from our recce, a little different this time without the snow, we’d got to the ski school slope! We were now approaching the highest point of the race at 1699m, 9 miles of climbing done. Fire torches lit the final bit of the climb. It was quite nice running alongside the heat of these for a few meters as it was noticeably much cooler at this height. I stopped at the checkpoint to fill my water bottle and still had the flat Coke for later in my other bottle. I grabbed some more Shot Blocs and a 9Bar and was off. Position hadn’t crossed my mind, I was actually first of the GB girls to the checkpoint but had assumed I would be 3rd or 4th. It wasn’t until later I found out I ran so well in that first section. I’d been walking lots, often walking far earlier than those around me when the climbs were just about runable had it been a shorter race so was surprised to be so far up the field. After all that climbing I was looking forward to the 6 mile descent that was coming. It had rained quite a lot in the hours prior to the race and the trail became far muddier. There was a tough climb up a muddy bank from St. Eustache to Col de la Colchette that involved scrambling and grabbing trees to avoid sliding back down in the mud. I looked back from the switch backs to see Sarah not far behind. It was great to see a familiar face as there had been very little chat on the trails, mainly because you had to concentrate on your footing so much. I was glad to run with Sarah down to the water station as I was suffering with some bladder discomfort, it wasn’t something I had experienced before and was in pain when I tried to go to the loo. It was handy Sarah caught me here as she’s a doctor so reassured me I was running well and all would be fine. There was a little climb after the water station when Sarah was much stronger so went ahead. I was not going well at this point, low on energy and wondering if this was related to the bug I had 2 weeks earlier. I was also worried as I was still getting the bladder pain, it was only a couple of miles to the next checkpoint though. I ploughed on to the gym at checkpoint 2 where I seriously considered dropping out. I went to the loo and there was blood in my urine which didn’t help the situation! I sat down for a few minutes, had a good drink and composed myself a little, it was only then Eleanor, one of the team managers let me know I was second Brit, I couldn’t believe it. She rightly said if I dropped out now I would regret it, I hadn’t done all this training to not complete the race. Simon was there and he put the plan in action of meeting me at the Col de la Forclaz. That gave me the instant relief that I had an opt out. Sarah had left me some dextrose tablets she had spare at the checkpoint, thinking I needed another sugar form to get better absorption. I took my sandwich, more Shot Blocs, refilled my water and coke and let them know I was plodding on, taking the next climb steady and would see how I felt at Forclaz. Lizzie arrived at the checkpoint just as I was leaving. I’m not sure if it was sitting down for that 5 minute break, adjusting the waist belt on my leggings or taking on the water but I was starting to feel better almost immediately. 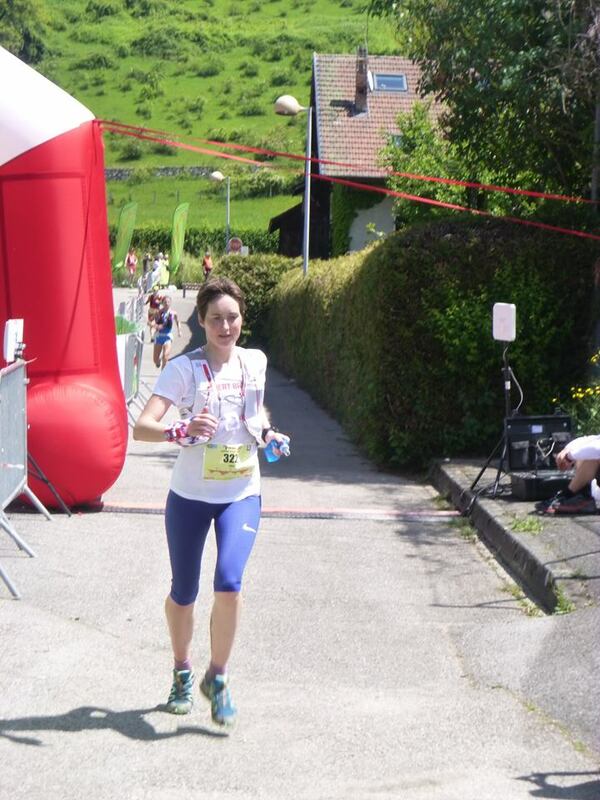 An American girl passed me on the road section as we began the ascent to Forclaz, she was running what was now becoming a walk for the rest of us! I commented how well she was doing to be running, she said it was only because she walked so much early on as she was having a really bad day. I did say if I come out of my bad patch as strong as she has I would be delighted! (I later discovered she was one of the pre-race favourites Krissy Moehl) There was another good distraction at this point, I had caught up with 2 Danish guys who were being led up the hill by a collie. They didn’t speak English, I didn’t speak Danish or French and the dog didn’t understand any of us so hopefully it hadn’t strayed too far and was able to find his was back to its owner! I heard the cow bells so knew there were people nearby, we were almost up to Forclaz, I saw Simon, he was relieved to see me in better spirits and feeling much better. There was no more thoughts of not finishing the race, I knew from this point on I was going to finish. The climb to Roc Lancrenaz was beautiful, it was now a lovely running temperature, the sun was out, there were mountain goats and fantastic views. It was a tough climb but I was now enjoying the ascents, this part of the course was the only bit we hadn’t recced as the snow prevented us over Easter. I took a Gu espresso gel, a nice change to Shot Blocs, Dextrose tablets and the Coke that had fueled me so far. I had plenty of bars with me but didn’t fancy any of them. The final section of the climb involved scrambling and pulling up on the ropes to the summit, just what you needed at 36 miles! The descent started off nice enough but soon became a horrible loose very steep trail, I was wishing the toe nail on my left big toe had followed the rights in dropping off a few weeks ago. I was slowing down due to the pain as the nail bashed on the front of the shoe but nothing could be done about it. Lizzie flew past, enjoying the descent far more than me! It was nice to get a “go GB” cheer from Robbie and Paul from Centurion as they effortlessly glided up the track. There was a nice run in to checkpoint 3 from miles 40 to 44 miles, varied terrain but nothing too steep. On approaching I heard my name being called. It was Crystelle, her partner Roland was running in the open race that started 90 minutes after us. On our recce weekend they had seen us out running, then later saw us waiting at the bus stop so had given us a lift back to Annecy. Recognising me, then remembering my name gave me a massive boost going into the sports hall. As I got in I was told Sarah was 10 minutes ahead and Lizzie had just left, the three of us were running a pretty even race. I didn’t stay too long here, got some coke, water, Shot Blocs and a handful of the all important chocolate covered coffee beans! I was thinking it would be about 2 hours to go to the finish, now I knew I had earned my GB kit, I was going to enjoy this last 9 miles. Mont Baron had 3 sections to it, the initial climb was a bit on roads, across fields then into woods, I adopted a run/ walk strategy on the roads. The second section was muddy, steep climbs through the woods. I caught up with Lizzie and we ran a short way together but then I pushed on. I pictured myself in the Peak District fells in my Dark Peak vest and powered up the muddy banks fell runner style with hands on knees. Other’s around me were struggling and those over taking had orange numbers, they were the quick guys from the open race. I powered on, overtaking about 6 women and another 6 or so guys, including the Argentinean guy who was having a power nap at the side of the trail. The trail evened out a little and it all became familiar from our little jog 2 days ago. Mont Baron was the last climb, we had 5 miles to go and that run on Thurs had only taken just over an hour. The last technical descent wasn’t easy with 50 miles in the legs, I was over taken by a couple of women but still passed a couple of guys. As I came to the switchbacks Lizzie’s partner Ed appeared, he surprised me saying Sarah was only 30 seconds ahead. The last mile and a half were flat, I could see Sarah in front now and thought I was running OK but was actually only doing 11 minute miles! This was it now, one last corner to the finish. 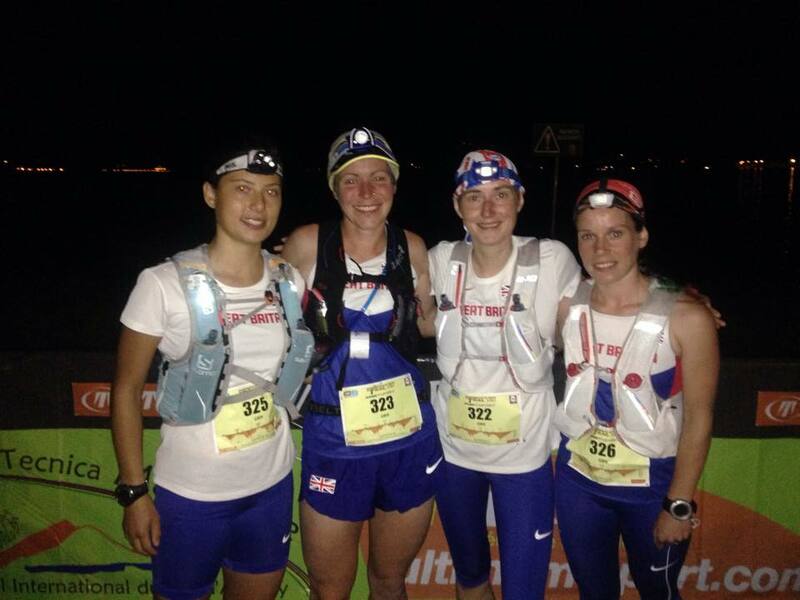 I was relieved to finish but chuffed with my position of 27th female, 126th overall and 2nd GB female, a few seconds behind Sarah, with Lizzie not long after, that also placed us 6th team. 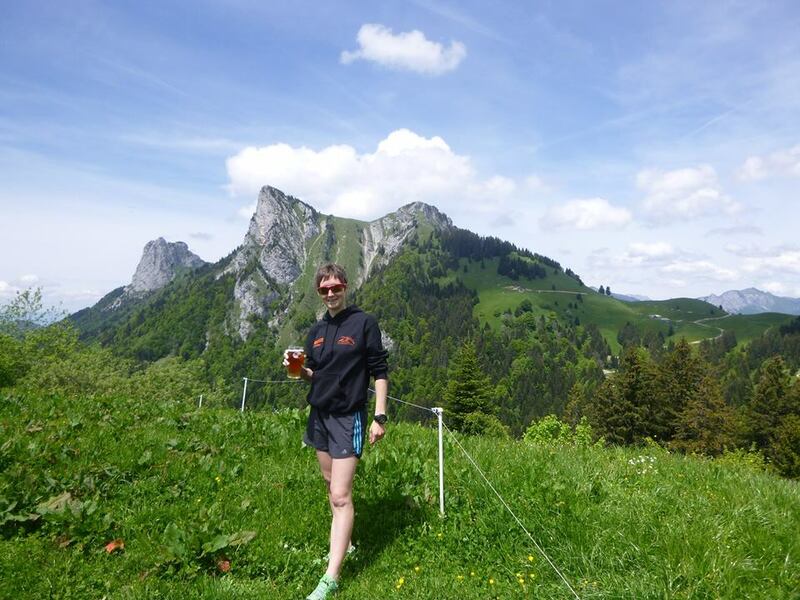 So, I had finished my first international trail race, a World Championships, wearing GB kit, and what a way to mark my 10th ultra! This will take some beating. We went straight to the Lake and stood in there enjoying the cold water for a good few minutes! It was a fantastic experience, I had the opportunity of a lifetime to represent my country at a hobby I love doing, see some amazing scenery and shared it with some amazing people who I can’t wait to meet up with and run with again. The whole experience has been unforgettable, from relaxing around the race village, the ceremonies, the race and I can only hope there are more opportunities to come. Thanks must go to the GB team for being so welcoming and friendly, the managers for all their organising, advice and support, especially Eleanor for not letting me drop out at Doussard! Thanks to Beta Climbing for the Injinji socks, Alkpit for the headtorch, Buff for the Union Jack Buffs, BetterYou for the vitamins and 9Bar for the bars. Lastly, thanks to Simon for the support through the training, recces and the race itself, if you hadn’t offered to drive to Forclaz I am not sure I would have carried on. Next stop Lakeland 50, at least there’s a little time to recover and celebrate first! The background is the Roc Lancrenaz.